Not only are there some great photos from past trips on the Columbia River but Conor really does a great job describing what the Power of the Canoe is all about. Conor will also be visiting us up on Lake Temagami while we are building the canoes and do a follow up article, which we are very excited about! So if you have any questions about who John and I are, read the article, check it out and help spread the good word about The Power of the Canoe! 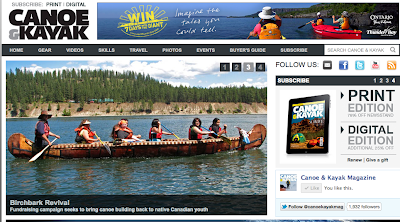 Thank you Canoe & Kayak, your magazine is awesome and we are honored to be on the website! May the River be with you!